If you are familiar with morphing technique, you may know its algorithm is: morph = deform the shape & cross-dissolve the feature. In normal cases, both the deformation and cross-dissolve were performed linearly. Now with the controls Feature Curve and Shape Curve, you can freely control the morphing process of feature and shape to produce more professional morphs. 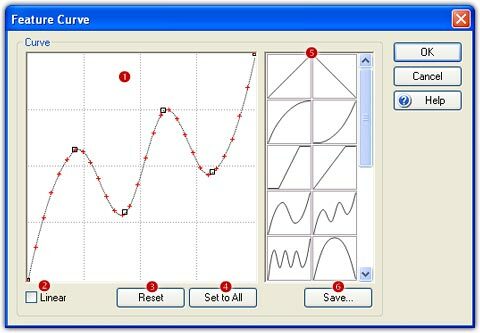 Choose the Sequence/Feature Curve menu to open the Feature Curve window, or Sequence/Shape Curve menu to open the Shape Curve window. FantaMorph 5 offers a new control, Master Curve, which can control the transparency of the morph. With Master Curve, you can easily make a fade in effect at the beginning of the sequence, or a fade out effect at the end of the sequence. 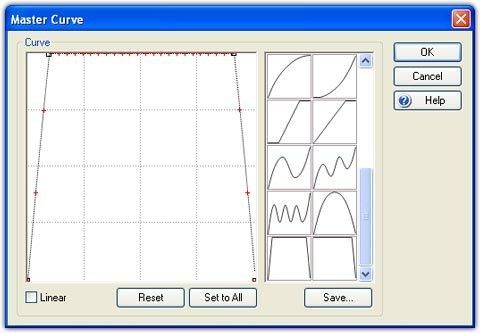 Choose the Sequence/Master Curve menu to open the Master Curve window. The curve is specified by a sequence of control points and smoothly passes through each point in the sequence. There are at least two control points on a curve. The red crosses on the curve mark the positions of each frame. Move Point: Drag and drop a control point to move it. Linear: Make the Linear option ( ) checked will result in a line strip. You can open and edit all Curve windows at the same time. In FantaMorph Deluxe, you can also use this window to set different curves for camera.